One Convenient Pack – a great way to sample! E3Live® Variety is 100% guaranteed. When defrosted, E3Live® Variety must be kept cold and refrigerated. Shelf life in the refrigerator is 7-10 days. 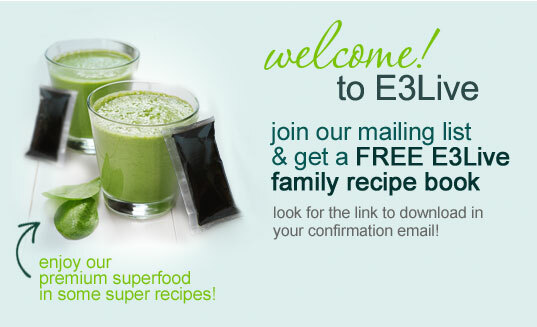 Do you want to try a sampler of E3Live, E3Live + BrainON, and/or E3Live + BrainON Supreme? Order one of our E3Live 16oz Variety Packs! In Pack A - you'll receive (3) E3Live 16oz original and (3) E3Live + BrainON 16oz, in Pack B - you'll receive (2) E3Live 16oz original, (2) E3Live + BrainON 16oz, and (2) E3Live + BrainON Supreme 8oz. To ensure E3Live® Variety arrives in its freshest state, we ship in quantities of 6 or more — we've found a minimum of 6 bottles keeps your E3Live® Variety optimally cold during transit to your door. The E3Live Variety Pack is a great way to test out the different versions e3Live has to offer. I have been using the original e3live liquid for about 6 months so I knew I'd love the 2 included but was curious about how the others tasted and most of all, I was curious about BrainON. Let me tell you, BrainON is AMAZING!!!!! I ABSOLUTELY notice a difference in my attention span, my focus and overall mental clarity when I took BrainON. From now on, THAT one is going to the one I purchase and recommend for others. I PERSONALLY didn't enjoy the Nectar version too much, I think there is TOO MUCH Agave in it as it's overly sweet. Agave in itself is VERY sweet so it's easy to overdue it. It's almost like drinking e3live and overly sweet syrup. The Mint version is also overly sweet due to the Agave in it but it's more tolerable because the mint sort of offsets it a bit. The description on the website did NOT say that all of the Mint versions contain Agave but I guess that they do (my variety pack had it) I was under the impression that there were 2 mint versions - one with and one without Agave but I think that all of their mint versions contain (too much) Agave. Overall, I wish this pack contained an unsweetened mint and 2 BrainOns!!! If you've never tried the original e3Live, then this is a GREAT set to purchase but if you have and like it, I HIGHLY suggest just buying the BrainOn! Either way, you won't regret it! Nice way to start off with E3Live, especially if you are not used to the plain 'green' flavor... the Mint and Nectar are delicious! I used to be addicted to caffeine...now I only have one cup of coffee in the morning and drink E3Live whenever I need a little lift! Wow what a Trip this is - I love being able to try all of the wonderful Flavors that E3live has to offer. BrainOn OMG!! It is soo great, Keep making awsome products like this. I love it!!! Started with original, moved on to mint and nectar--my favorite is BrainOn! I find I look forward to taking it every morning! So far I have tried the original, mint and nectar and can surely tell a difference in the tastes. I have also felt a surge of energy with each.